SALE - Normally $180/case, Now $149.95/case plus FREE SHIPPING! This is a great pheasant and Upland game bird 20 guage lead load! A special manufacturing process gives Kent's Lead Diamond Shot® a highly polished shot. Teamed with premium components, Diamond Shot in new Ultimate Fast Lead produced better patterning, penetration, and performance compared with standard lead shot, and it attains velocities over 1300FPS depending on shot size. 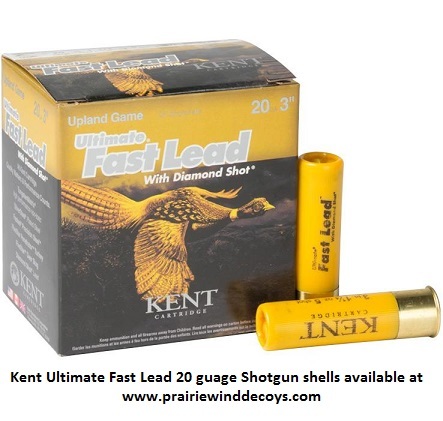 If you're serious about increasing your bag limit on upland game, try some of these 20 guage Ultimate Fast Lead shotgun shells and see the difference! SALE! Normally $180/case, Now $149.95/case! PLUS FREE SHIPPING!